Backstreet‘s back at the Grammys! The group – Brian Littrell, AJ McLean, Nick Carter, Kevin Richardson, and Howie Dorough – happily hit the red carpet together at the 2019 Grammy Awards on Sunday (February 10) at the Staples Center in Los Angeles. The Backstreet Boys are up for Best Pop Duo/Group Performance for their hit “Don’t Go Breaking My Heart” – their first nomination since “Shape of My Heart” at the 2002 ceremony. FYI: Kevin is wearing a Giorgio Armani tuxedo. 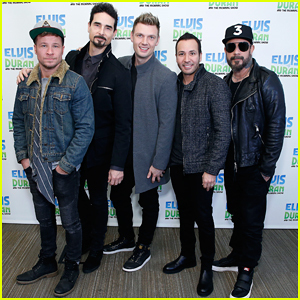 The Backstreet Boys flash a smile together while posing backstage at The Elvis Duran Z100 Morning Show held at Z100 Studio on Monday (January 28) in New York City. The guys – Brian Littrell, Kevin Richardson, Nick Carter, Howie Dorough and A.J. McLean – sat down with host Elvis to promote their brand new album DNA, which was released on Friday. That same morning, the Backstreet Boys stopped by Live with Kelly and Ryan and talked about their first impressions of each other when they formed the band 26 years ago, going back on tour, and their Grammy nomination for Best Pop Duo/Group for “Don’t Go Breaking My Heart” – their first nomination since “Shape of My Heart” at the 2002 ceremony. Backstreet Boys Surprise Fans During Cycle Class at Flywheel! The Backstreet Boys gave a group of lucky fans the ultimate surprise when they popped in a a BSB-themed cycle class! 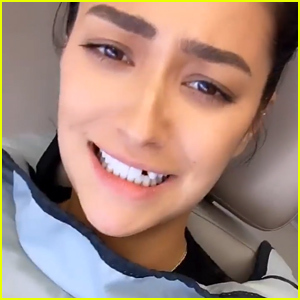 The surprise happened to celebrate the group’s new single “Don’t Go Breaking My Heart” on Wednesday (May 16) at Flywheel Sports in Los Angeles. Nick Carter and Brian Littrell jumped on the bikes to join the workout while AJ McLean, Howie Dorough, and Kevin Richardson hyped up the group at the front of the room while they cycled. After the guys showed up, the class sang and danced along to favorites like “Everybody” and “I Want It That Way.” So fun! 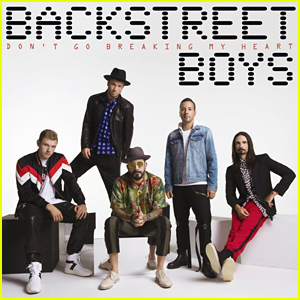 Backstreet Boys: 'Don't Go Breaking My Heart' Stream, Lyrics, & Download - Listen Now! The Backstreet Boys are officially back with a new single! The boy band just dropped their first new song in over five years – and you can listen to “Don’t Go Breaking My Heart” here! After weeks of teasing, the guys – Nick Carter, Brian Littrell, Kevin Richardson, AJ McLean, and Howie Dorough – dropped their hot new song along with music video to go with it. You can download the Backstreet Boys new song off of iTunes here. Watch the music video for “Don’t Go Breaking My Heart” below!! Sofia Vergara & Joe Manganiello Have Date Night At 'We Are X' Premiere! Sofia Vergara flashes a smile alongside her husband Joe Manganiello while sitting in the audience at the premiere of Drafthouse Films’ We Are X held at the TCL Chinese Theatre on Monday (October 3) in Hollywood, Calif. The happy couple were joined at the event by Gene Simmons and his wife Shannon Tweed, Marilyn Manson, A. J. McLean, Yoshiki, and Gene‘s daughter Sophie Simmons. We Are X is a documentary that follows the story of Glam rock band X Japan, who ignited a musical revolution in Japan during the late 1980s. Twenty years after disbanding, Yokshiki X, the leader of the band, wrestles with physical and spiritual demons to bring the band’s music to the world – Watch the trailer below!